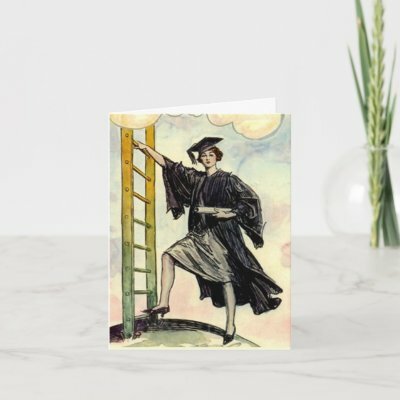 The Graduate And The Ladder! Recently,I spent the week-end in Burlington, Vermont. On that Sunday Morning, it was graduation day. That’s it! I got it made! I have arrived! We never stop learning. We never stop being challenged. We must always get out of our comfort zone. Because if we don’t, we stop growing. Even worst, we shrink in every possible ways. Think of muscles that atrophy when not used. Think of a brain that is never challenged intellectually. Think of the fear of public speaking when you don’t practice often enough. Think of every possible skill or activity that you haven’t practiced for a while. The time that you invest in challenging yourself, in stretching yourself is what you need to grow out of your comfort zone. Everything we do in life is similar to climbing the rungs of the ladder. We must climb one rung at a time. We must climb regularly.This involves a continual effort. There is no such thing of something for nothing. We must pay the price day in day out. Let’s not fool ourselves by the thought that we have reached our destination, we are constantly travelling and discovering. That’s what makes life exciting. That’s what make this life worthwhile. Graduates! Today is the first day of the rest of your life.